I just love your bracelet with the bottle lid. 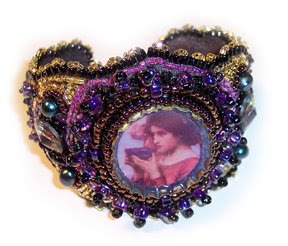 I have made one other embroidered bead cuff and am hooked. It came out pretty good for a first try. I would like to make your bracelet. Do you have a pattern I could buy? Or is it in a book? I am not much of an artist so it would definitely be a challenge to get the bracelet pattern on a backing. I plan to keep the bracelet for myself and not use a brass cuff but back the bracelet only, sewing the two pieces together. I have a very small wrist --5 1/2"--cuffs feel awkward to me and look too big. I think it would work out with a closure of some sort sewn on--what do you think? Turns out that I did have a tutorial for that bead embroidery cuff, but it didn't have a specific pattern. I do think that a stitched closure would work out fine, maybe a sewn on button style like these. What I used was a very plain cuff blank, much smaller than the finished piece, and the stiffness of the beadwork helped keep the shape firm around the edges. 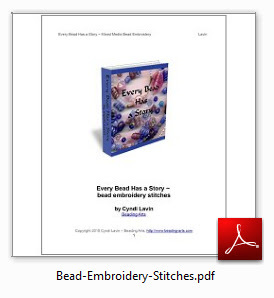 I also suggested to Shirley that she help herself to the free download of my first e-book chapter, titled Bead Embroidery Stitches.